Windows shopping. Does the employee-to-patron ratio indicate doom for Microsoft? Let's go to the mall -- today! Looking a bit like a lonely Oldsmobile dealership before closure, one Microsoft mall store I visited a few days ago had a pitiful melancholy feel to it. It stood in contrast to the bustling Apple store a few doors down. If this level of disinterest is indicative of things to come, Microsoft and its partners are in for a hard fall during the coming years. The Microsoft store opened very recently, but was not enjoying much of a honeymoon period. Although Microsoft was practically giving away $25 gift certificates in a Pepsi-Challenge like mobile OS competition, I didn't see anyone buy a single item at the store, and most Windows Phones being displayed went completely untouched. I calculated what I'll call the "employee-to-patron ratio" at both the Microsoft store and the Apple store. Even during the busiest of times, there were always more Microsoft employees on the floor than visitors, and this included teenagers who just stopped in to play Xbox games. The average ratio I came up with was 13-9, that is, 13 Microsoft floor employees to each potential customer in the store. And there were times the store had only two patrons. Compare this to the Apple store which consistently was filled with engaged patrons and real customers. I counted 18 floor employees at this particular Apple store and never less than 38 patrons. And many of these were really purchasing products. Perhaps it's not fair to read too much into this anecdotal observation. 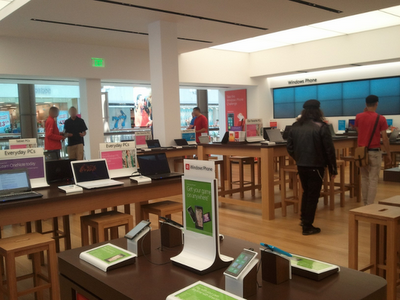 Things might be significantly different at Microsoft stores in other parts of the country. Or during other days of the week. 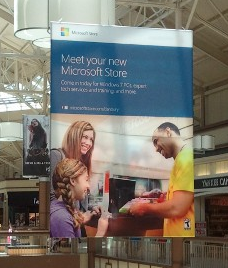 Or perhaps this is just a teething period for Microsoft's brick-and-mortar retail push as it builds awareness. There is obvious potential for the stores to become great arcades, marketing Xbox and Kinect. One thing is for sure: Microsoft and its partners must begin to monitor market conditions very closely and take any feedback (or lack of feedback) very seriously. Microsoft isn't the near monopoly it once was, and we've learned over and over again that giants can fall hard and fast. There might be more below the surface here to Microsoft's retail strategy, but I'd say it's time for Microsoft to learn how to be hip. And it's not hip to be bare. At the Microsoft store: standing room lonely. 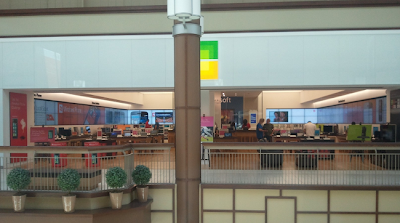 So go to the mall, today, to visit the Microsoft store.